Another New Zealand junior novel, this time from Raglan's Sarah Johnson, which I enjoyed so much I couldn't get anything done today, I kept having to pick up Phenomenal to see what was going to happen next. 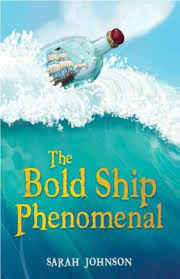 As is obvious from the cover, The Bold Ship Phenomenal is a ship in a bottle, found on the beach by 11-year-old Malachi. He's feeling despondent and putting off getting to science class which he finds difficult. His teacher, Mrs Green, is hugely enthusiastic, in fact she sounded like a great science teacher, certainly better than many I've experienced. But Malachi finds it tough, and when she is explaining the details of their latest project he switches off and doesn't really know what he's meant to be doing. One of the reasons he's down is that his dad isn't being a very responsive father, refusing to do anything interesting, like going camping, but just wanting to stay at home, as they've done since Malachi's mother died. It sounds as if she, like Mrs Green, was full of enthusiasm for everything and her husband and son both miss her terribly. 'Phenomenal' was one of her favourite words which Malachi chooses to name the ship. As in most school stories, there's a bully boy too - Jarrod, but his own story isn't straightforward either, as Malachi finds out as the story progresses. After seeing an article about an environmental protest up north Malachi decides to take himself on an adventure and get his science project done at the same time and stows away on a truck. He gets more than he bargained for with snails, a piglet and a whole lot of native wildlife involved. At the same time as Malachi is having his not-so-fun adventure, there's also action, much to his surprise, on the ship in the bottle, which in many ways mirrors the challenges that Malachi is facing. It's all mighty exciting, with humour thrown in, and I reckon readers will be as reluctant to put it down as I was. This story was shortlisted for the 2013 Kobo/NZ Authors E-publishing prize, and Sarah was previously published by Scholastic after winning the 2011 Storylines Joy Cowley Medal for her picture book Wooden Arms, and a beginner chapter book called 'ella and 'ob. Have a look at Sarah's interesting website. The Bold Ship Phenomenal is also available as an ebook. I hope you do Sheryl, purely because Gwyther was my mother's maiden name, and I have often considered adopting it myself. A very stylish name for an author (and a reader) I think. Thanks for the lovely review Crissi. I appreciate it. I'm so glad you enjoyed the story too. I always hope that my stories will find readers (other than my mother) who enjoy them, so I'm glad you did. I'm especially pleased that you enjoyed the humour, as I wanted to slip that in there to alleviate the tale. I can see you are very busy with your reviewing, but if you're looking for a good book, I am reading Kate De Goldi's latest - From the Cutting Room of Barney Kettle- at the moment and loving it. Thanks Sarah, I read Kate's book when it first came out, must get a review done for it. I loved the book too [another school librarian speaking] and will recommend it for read alouds.